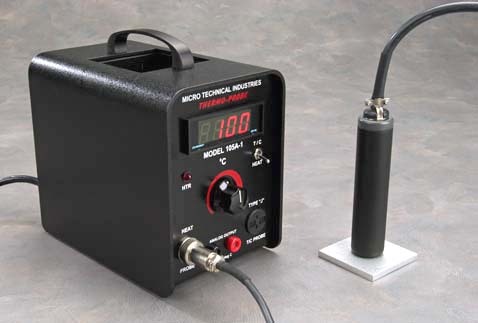 Thermo-Probe Model 105A-1 provides a visual Digital Read-Out and allows you to heat-test integrated circuit components with constant ease and accuracy. Ideal for both engineering lab and production line use. Your choice of 5 watt, 9 watt, 35 watt or 70 watt heat probes lets you put heat where you want it...and you can do it right on your test bench. The Model 105A-1 operates from +25 to +200 degrees centigrade, with an accuracy of +/- 1 degree centigrade... or better. It allows you to check integrated circuits, large grid arrays, diodes and transistors to pinpoint heat-drift and thermoelectric problems without damage to expensive components. No need for cumbersome ovens or heat chambers. The digital meter monitors temperature feedback while a reliable solid-state controller continuously monitors the probe temperature and regulates it to the temperature you set on the control panel. It takes only seconds to bring the probe from ambient temperature to your setting. The Analog Output feature is ideal for recording your data to Data-Loggers, Strip-Chart Recorders, Computers and other instruments. Heat Tips: Tips are available for nearly all types of electronic components. Custom tips can be supplied per your drawing.